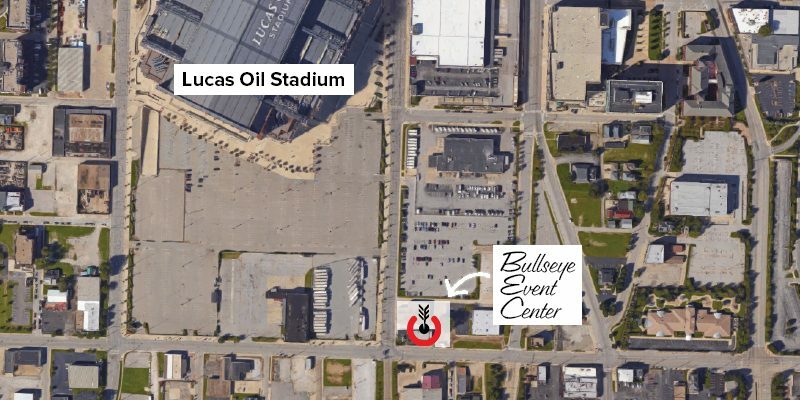 The brand new Bullseye Event Center is located directly across the street from Lucas Oil stadium. 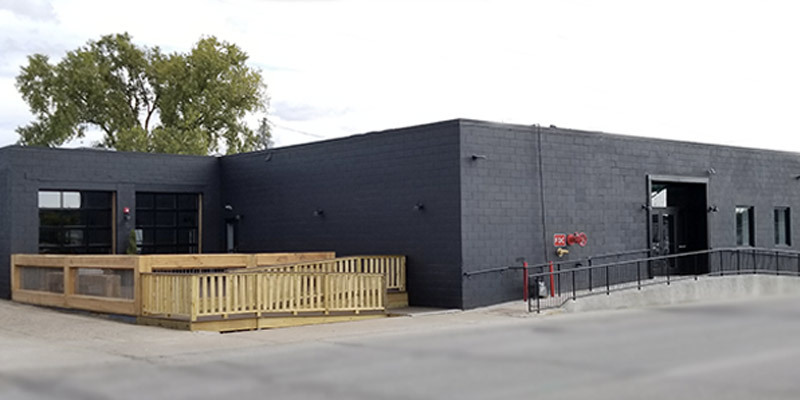 Not a few blocks, not down the street, not a short walk but literally located on the other side of the street from Lucas Oil Stadium at 723 South Capitol Avenue. Bullseye Event Center (B.E.C.) 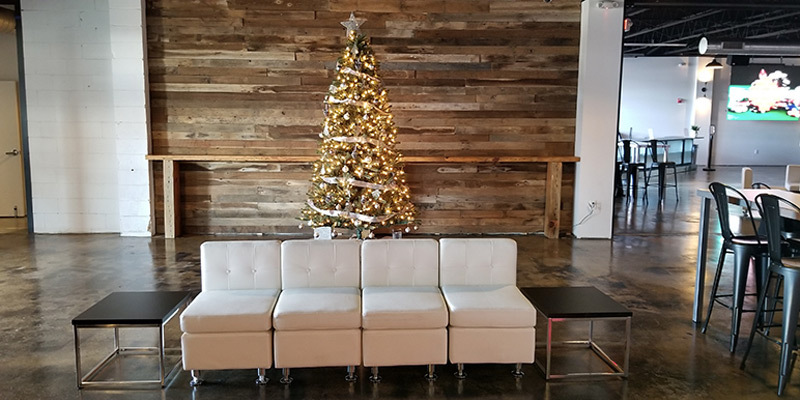 is 9500 square feet of fully remodeled, free flowing open event space. An industrial feel with acid washed concrete floors and exposed brick, B.E.C. 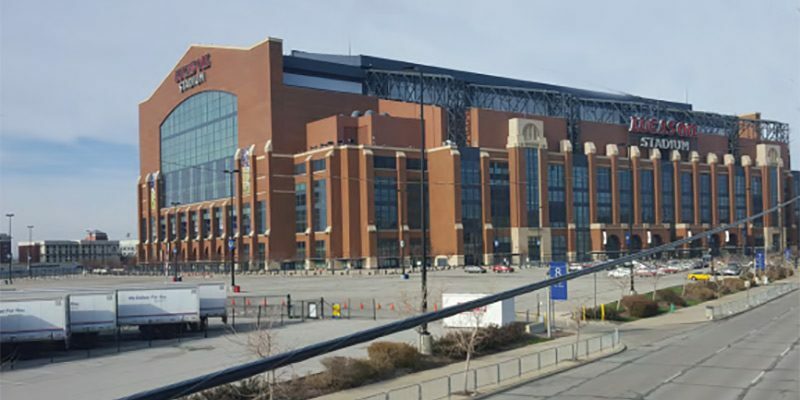 features dramatic views of Lucas Oil Stadium and the entire Downtown Indianapolis skyline. 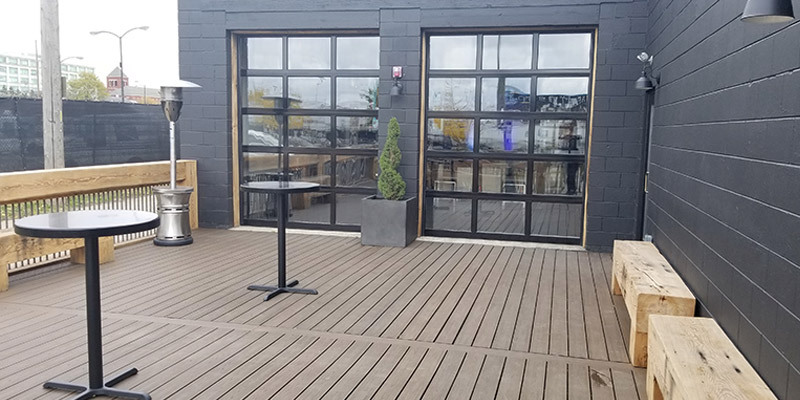 B.E.C is equipped with 3 retractable glass garage doors. 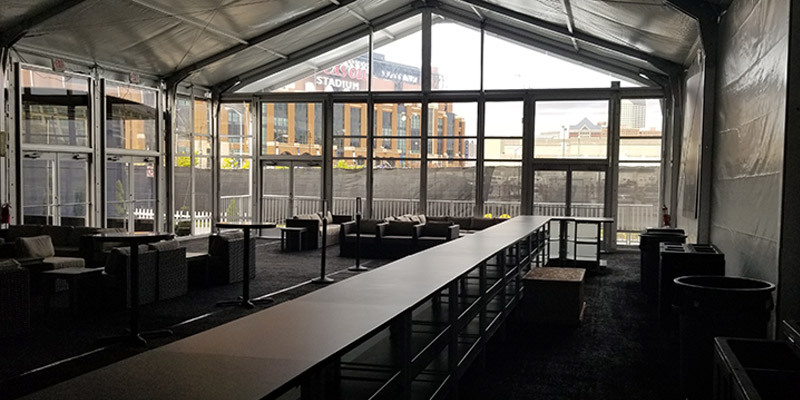 Two on the front of the building open up to our brand new Trex deck which gives your guests the ability to sit under the shadows of Lucas Oil Stadium. 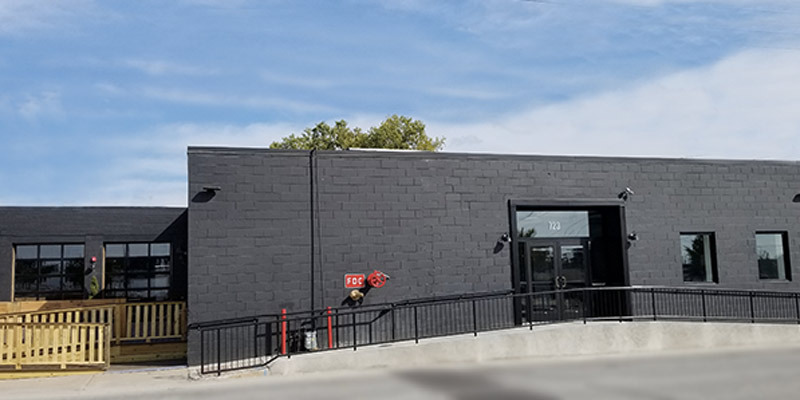 The third glass garage door opens up to 5000 square feet of custom stamped concrete with beautiful green space. Building capacity ranges from 750-1000 people depending on set up and use of outdoor spaces. 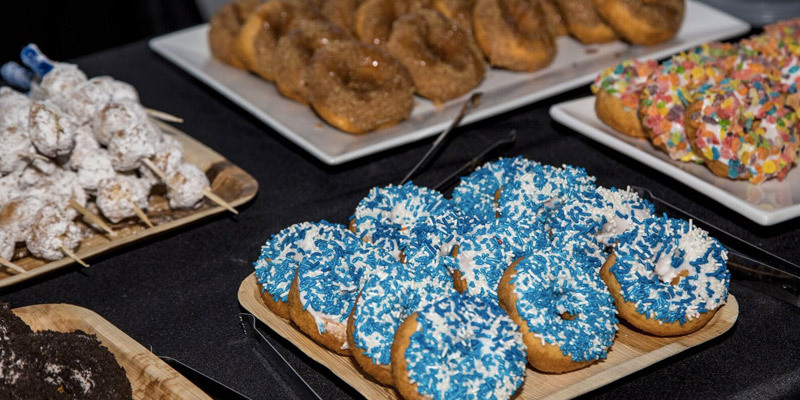 B.E.C is different than any other event center in Indiana – our in-house Bullseye Catering Group is led by Food Network Celebrity Chef Aaron May. 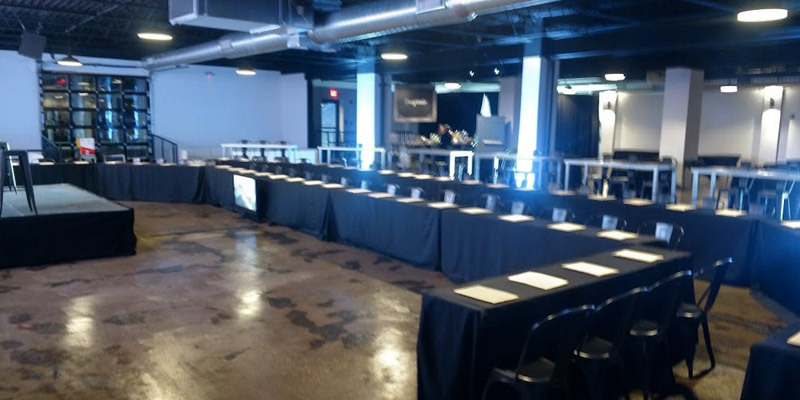 Any top chef in America can prepare an incredible meal for 2 – 200 people, but in order to be considered one of the best you need to be able to create a meal for 2200 and have it be just as good as that meal for 2 – 200. 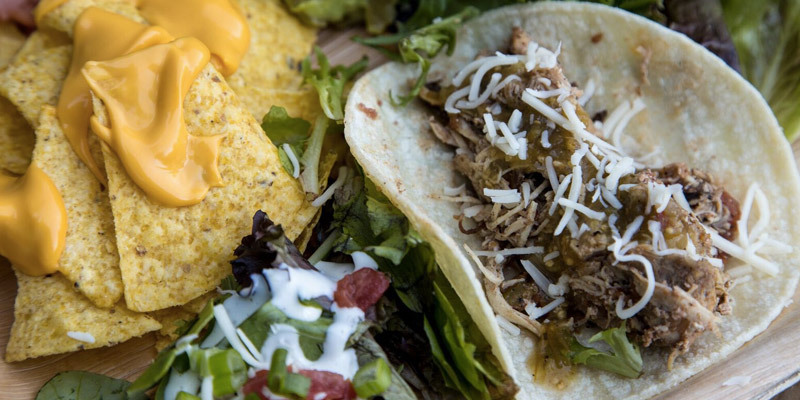 That is why Aaron May is considered the BEST caterer in the U.S. Chef May trained in Paris at the Ecole Ritz Escoffier and was inducted into the Arizona Culinary Hall of Fame in 2010 as a “Chef Extraordinaire.” He has been featured on Food Network’s wildly popular Guy Fieri’s Diners, Drive-Ins and Dives, Guy Fieri’s Grocery Games and TLC’s Best Food Ever. 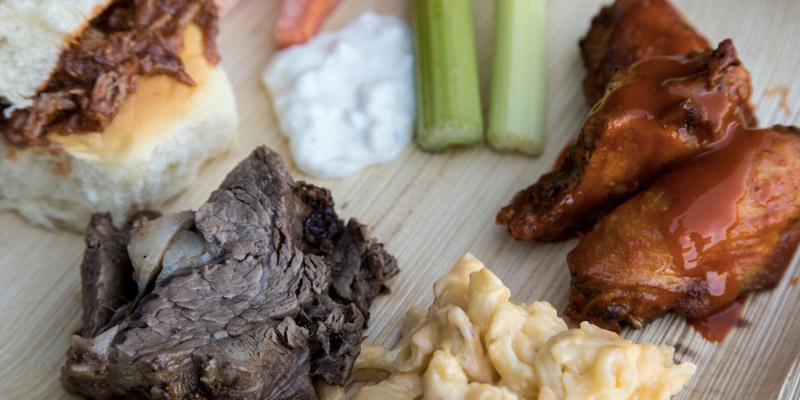 Plan your event and create your menu side by side with a Food Network Star. 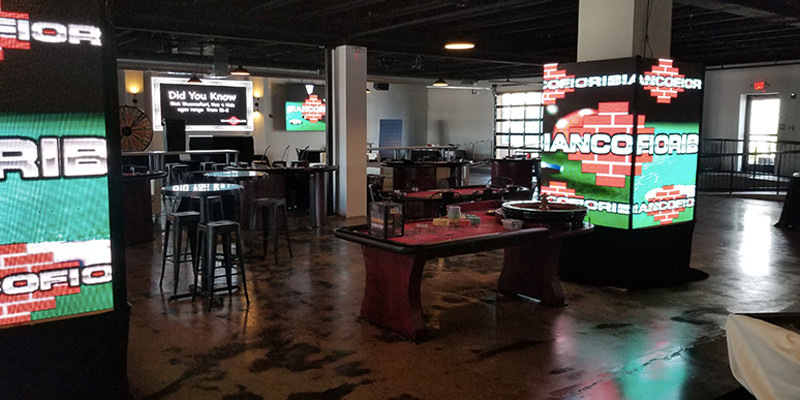 Bullseye Event Group is the hospitality industry leader in the sports world. 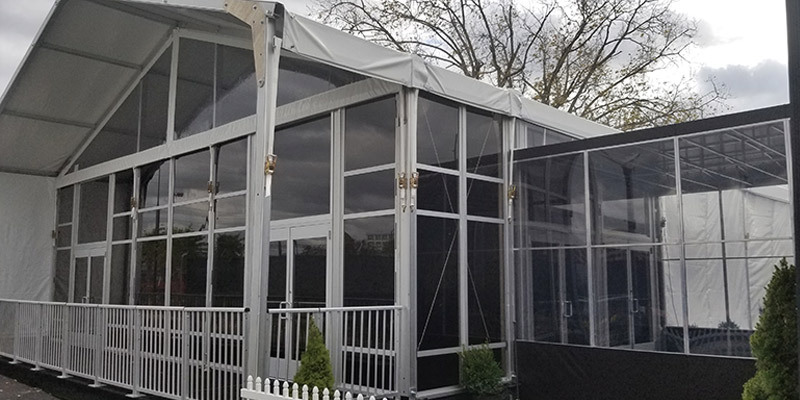 Our staff has been creating and building events from scratch for the past 28 years, our knowledge and our vision is annually recognized on the biggest national stage. Knowledge is everything. 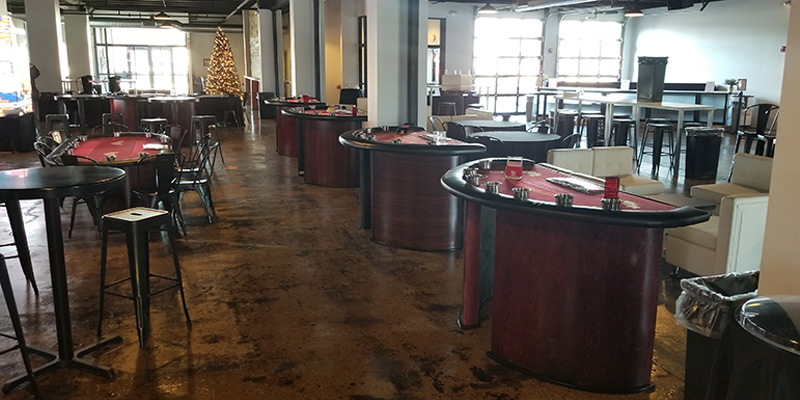 In 2005, Bullseye began building the hospitality side of our business. We have always offered hospitality, but in 2005 we had the vision to begin providing once-in-a-lifetime hospitality. 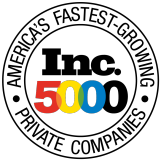 Bullseye Event Group staked its claim as the premier hospitality provider for sporting events all around the world. 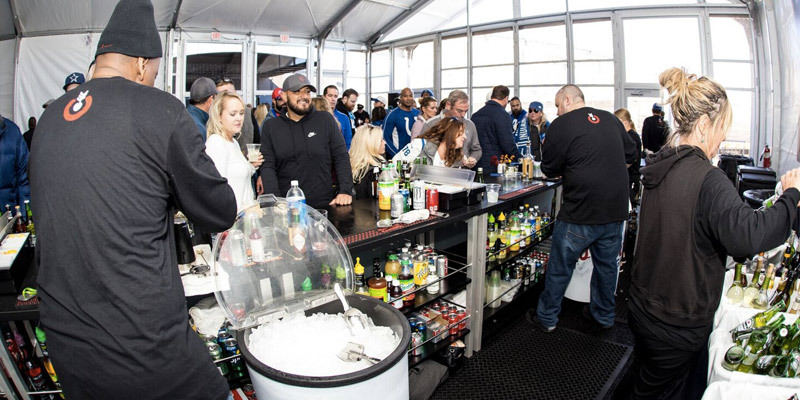 From The Colts VIP Tailgate to Gate 6 Hospitality at the Masters and The Players Tailgate at the Super Bowl we proud to be the industry leader in hospitality – literally the bullseye that other companies strive to hit. 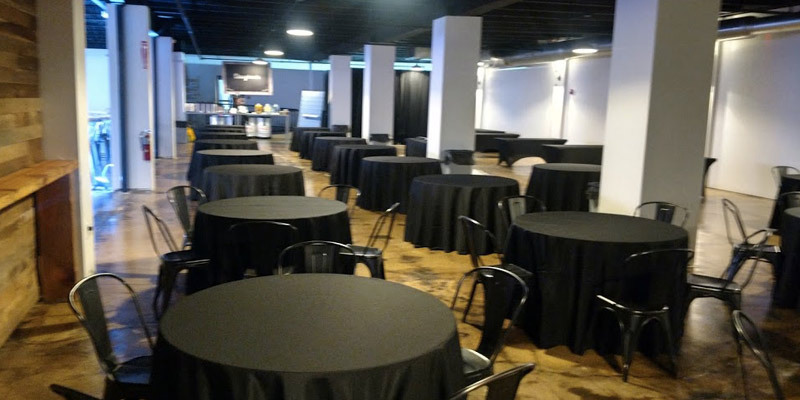 Whether it’s a wedding, trade show, sporting event, corporate gathering, social event, or a religious or non-profit charity event, we are bringing the next level of hospitality to Indianapolis at Bullseye Event Center. 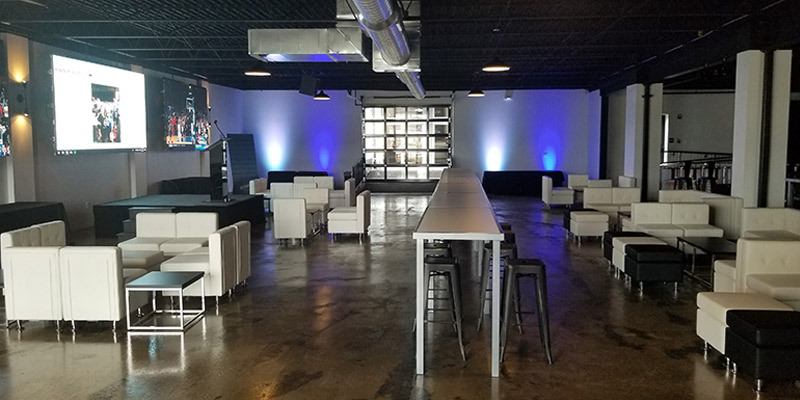 When booking your private event at BEC we will provide round VIP trip transportation in our Mercedes Sprinter at no additional charge (gratuity not included). Leave the driving to us! We can pick your group up at your doorstep in our 14 passenger VIP Mercedes Benz Sprinter. Your group is driven by our licensed chauffer who will drive your group to your event at Bullseye Event Center. 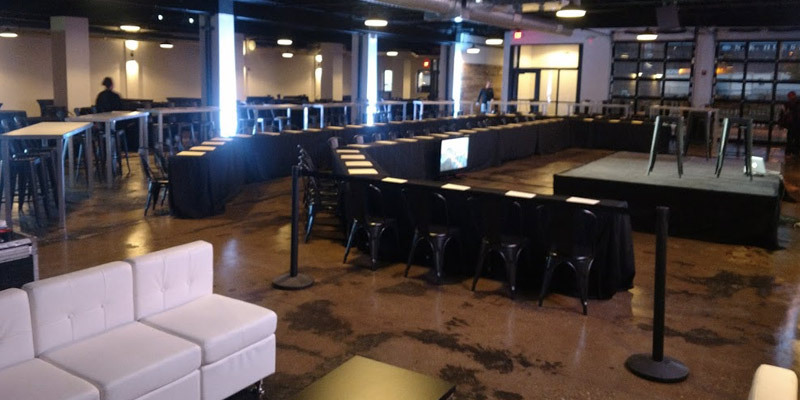 Incredible venue, best location, best food and award winning staff is why B.E.C is the right choice for your event in Indianapolis.